With inviting displays and beautiful designs, it is easy to see why boutiques have risen in popularity. At More Space Place, we want to encourage homeowners to creatively think about spaces in their home. Why not take the attributes you love in boutique stores and re-imagine them in a closet setting? Here are the top things you should consider when designing a boutique custom closet. The small details of a custom closet are what make it distinctly yours. What items do you have an abundance of? What do you hardly touch? Your boutique closet should display the items you love, showcasing your personality and making everything easy to find. One of our favorite closet accessories may seem obvious, but many closets lack a way to keep shoes organized. They often times end up forgotten near the front door or in a jumbled pile at the base of your closet. A custom shoe rack will allow you to find your shoes, even when you’re in a rush. Do you have an extensive jewelry collection? We can install custom drawers, allowing you to organize everything – from your favorite necklace to the pair of earrings that you forgot you had. A crumpled tie is immediately noticeable and rushing to steam it before work is a hassle. A tie rack is a simple way to find the tie you’re looking for and keep it from wrinkling. 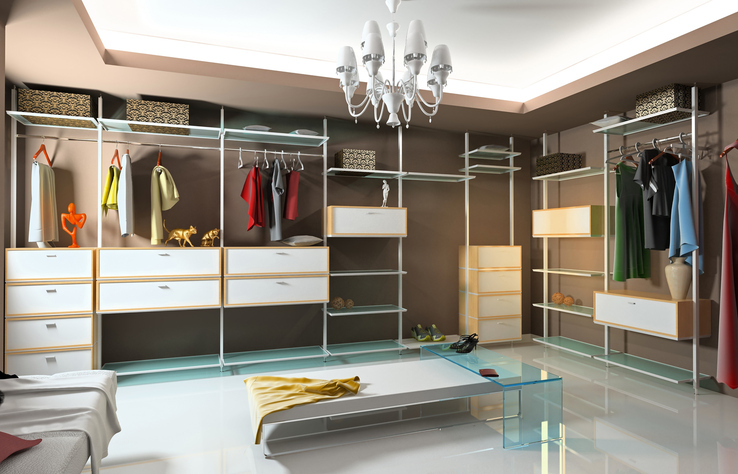 When planning the design of a boutique closet, think about additions would make your mornings smooth. While every closet at More Space Place is customized for your specific needs, we know that there are some closet characteristics many homeowners desire. Here are some of the practical closet elements many of our clients love. Almost every boutique has a small seating area to try on shoes and clothes. While you probably haven’t considered transferring this to your new closet, it can be a great addition. Wouldn’t it be nice to have a place to sit while putting on shoes in the morning? A laundry cabinet is the best way to hide your dirty laundry and keep your custom closet looking like a beautiful boutique. Your laundry bin will always be within reach, but out of sight. A center island is the perfect mixture of luxury and practicality, as it will make folding and putting away laundry easy. Besides being a place to house your jewelry drawer, a center island is a great place to display a bouquet of flowers. From start to finish, your closet is about you and your needs. At More Space Place we want you to show off your personality. A simple way you can show off your décor style is through the color scheme of the closet. A bright white could give a modern feel, while a wood finish could create a rustic aesthetic. Beyond color schemes, consider the addition of a fun area rug or knick-knacks that you love. We can help you make the closet feel like yours. Get a perfect boutique style closet with More Space Place. Give your local designers a call today to get the custom closet of your dreams. Don’t Downsize Your Wardrobe. Upgrade Your Closet!